Laurie Armijo of Niwot, CO uses a rescue inhaler after recently discovering that her persistent cough was actually adult-onset asthma. 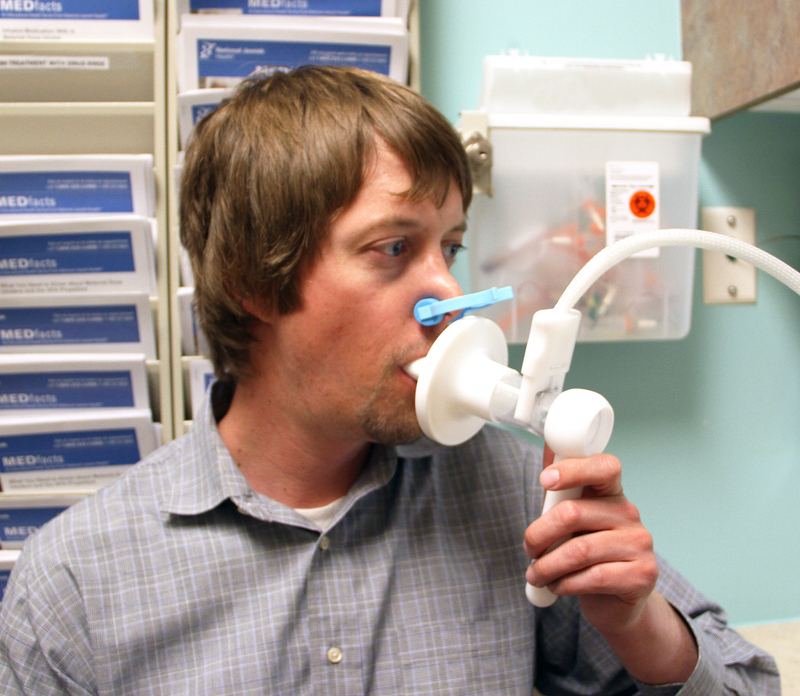 DENVER – A new national asthma survey commissioned by National Jewish Health shows that many adults are unaware of common symptoms of asthma in adults. Doctors say that the findings explain why many adults with asthma may not realize that they have the disease, and don’t seek treatment that can help them. The survey shows that, while people are aware of some of the most common asthma signs such as wheezing and shortness of breath, many don’t recognize other warning symptoms like trouble sleeping, chest pain, and persistent cough. Dr. Beuther said that one in every 200 adults are newly diagnosed with asthma every year. And while children with the disease might have more common symptoms, adults who develop asthma typically have some of the less recognized symptoms. The survey, commissioned by National Jewish Health, was conducted by ORC International Telephone CARAVAN® on March 3-6, 2016 via telephone. The combined sample consists of 1,002 adults (ages 18 years and older) living in the continental United States. “These results are not surprising to those of us who see patients regularly. As a pulmonologist, I see people with symptoms that aren’t yet defined like difficulty breathing, cough and episodes of recurring bronchitis. When we first embark on trying to figure out what that is, I often mention that one of the big three causes of chronic cough, for example, is asthma. And it’s more common than not that my patient is surprised to hear that a chronic cough or recurring bronchitis is actually asthma,” said Dr. Beuther. 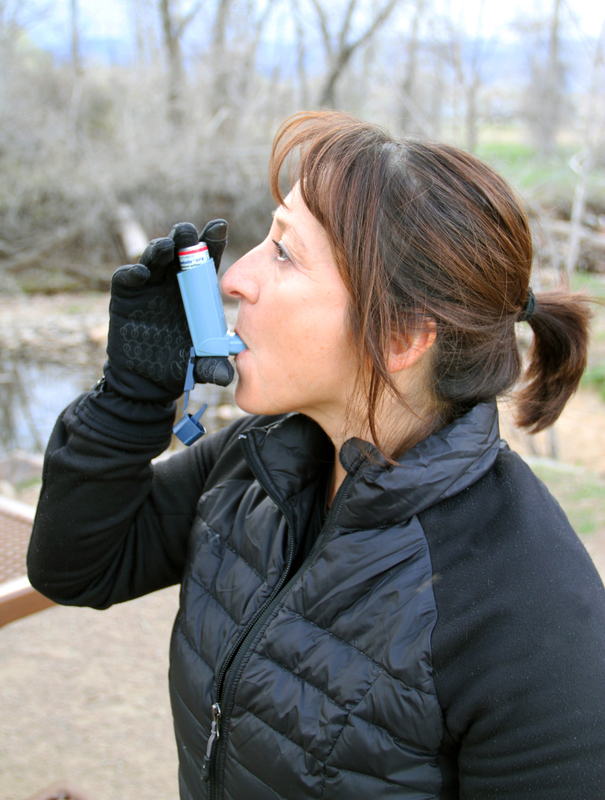 An avid hiker and cyclist diagnosed with asthma in her forties, 54-year-old Laurie Armijo of Niwot, Colorado is one of the more than 17 million adults who have asthma1. “When I was diagnosed with exercise induced asthma it was very difficult because I had to pretty much give up a lot of the sports that I love. It was kind of scary for me because I could not breathe to run, walk fast, swim or ride my bike. I basically couldn’t breathe,” Armijo said. Armijo now uses an inhaler when exercising so that she could resume her active lifestyle. Good medical care and monitoring can keep asthma under control. 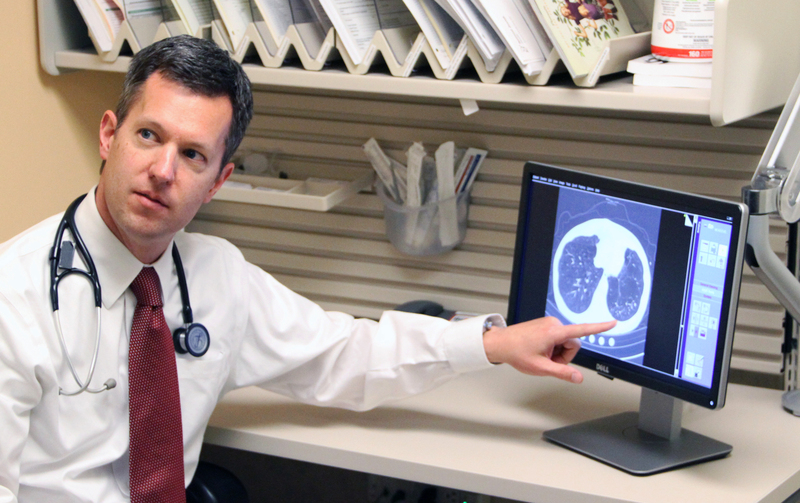 Dr. David Beuther reviews images of a patient`s lungs at National Jewish Health in Denver, where a new study found most adults are unaware of some of the most common symptoms of adult-onset asthma. 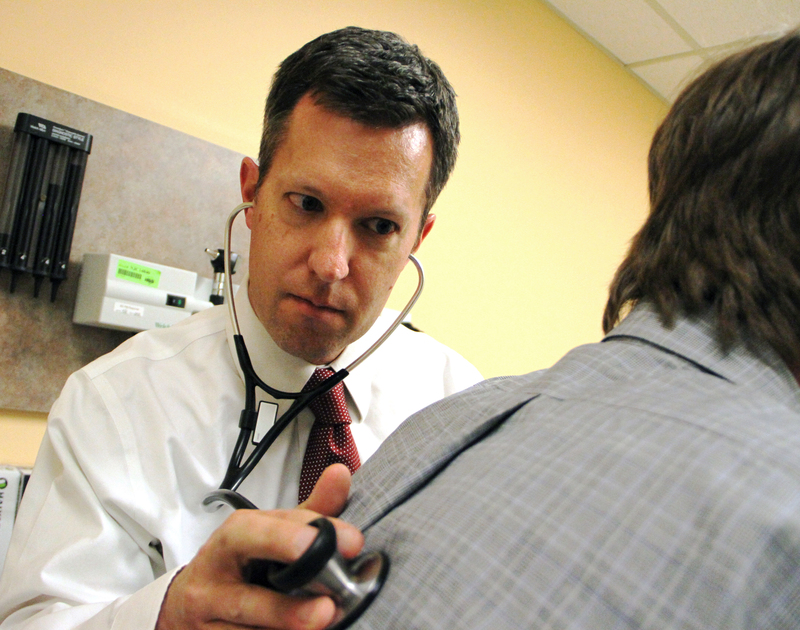 Dr. David Beuther examines an adult patient for breathing problems at National Jewish Health in Denver. One in 200 adults are newly diagnosed with asthma each year. A new survey from National Jewish Health found that most adults are unaware that trouble sleeping and a persistent cough are subtle, often overlooked symptoms of adult-onset asthma. A persistent cough and shortness of breath kept Laurie Armijo of Niwot, CO from her active lifestyle, until doctors at National Jewish Health diagnosed her with adult-onset asthma and taught her how to manage it.